A Buffalo State project designed to help students, faculty, staff, and the community better understand the refugee situation globally and in Buffalo has received an Outstanding Student Affairs Program Award from the SUNY Office of University Life and Enrollment Management. The “Refugee Awareness Project: The World at our Doorstep,” spearheaded by the Volunteer and Service-Learning Center, won in the Student Affairs-Academic Affairs Collaboration category. 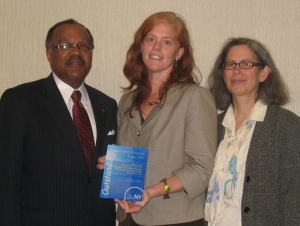 Hal Payne (pictured at left), vice president for student affairs, and Laura Hill Rao (pictured center), coordinator of volunteer and service learning, accepted the award at the Chief Student Affairs Officers meeting held October 24 in Corning, NY. A SUNY selection committee chose five winners from 27 nominations representing 12 campuses. 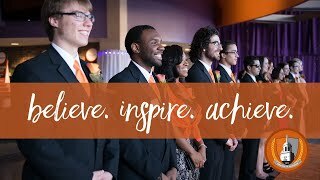 More than 1,000 students, faculty, staff, and community residents participated in the Buffalo State project, which included educational initiatives and volunteer and service-learning activities. The project arose from a recognized need for education about the refugee population. Resettlement organizations, refugee leaders, and faculty members provided input into the types of activities that would support student awareness and preparation, as well as increase student engagement with refugees. During the year, those activities included hosting a panel of local refugees from six different countries who shared unique experiences to a standing-room only audience, a film presentation about Sudanese refugees, 10 service-learning courses connected to meeting the needs of the college’s refugee neighbors, and three volunteer events that directly supported refugee families and service organizations. A grant from the SUNY Office of Equity and Campus Diversity, a mini-grant from the Western New York Service-Learning Coalition, and the Service Collaborative of Western New York funded the initiative.